Even If You Know NOTHING About Athletic Development Right Now! Imagine how great it would feel to walk onto the field at your next game, knowing you had an Ace up your sleeve that almost guaranteed victory for your team. Think of the satisfaction you'd feel, knowing your girls were better conditioned, better prepared, and more confident than their opponents. And think of how much FUN it would be to coach athletes who possess that "extra gear" to dominate their competition at will. It's all possible - downright easy in fact - once you discover the simple secrets I'm about to reveal. But before we go any further, let me dispel one ridiculous myth that FAR too many coaches still believe. "You Can't Teach Athletic Ability!?!" It's crazy that some people still buy into this... despite the millions of dollars in research... thousands of hours of lab testing... and real world results you can see on the fields and courts everywhere you look. Sure - some kids win the genetic lottery and are born with more fast-twitch muscle fibers... or better eyesight... or a stronger arm. That's right. Starting today, your softball players CAN make dramatic improvements in their athletic ability (and reduce the risk of injury)... safer, faster and easier than ever before! An unstoppable pitching staff that intimidates every team in your league... an aggressive, high scoring offense that manufactures runs at will... and a stunningly effective group of fielders that executes your defensive strategy to perfection... it's all within your reach! "So What? I Already Do This Stuff In Practice"
Kudos if you're already using athletic development exercises with your players. But take a second and ask yourself... are you 100% sure you're doing the right drills? With the right form and technique? The right level of intensity? Have you updated your training techniques to compete with a new generation of athletes and expectations? This is NOT about doing "traditional" softball conditioning exercises like push-ups, crunches or shuttle runs. That stuff is for the birds compared to this. All explained and demonstrated by an athletic development "guru" with more than 28 years of elite-level experience coaching male AND female athletes. It's called "Explosive Softball" - and it breaks down all the essential skills and drills you'll need to develop a supremely athletic squad, and start dominating your opponents in every phase of the game. I'm 100% confident that if you implement these techniques, your kids will out-run, out-hit, out-pitch, and out-defend EVERY team in your league. Or... how skinny, short or "soft" they appear. Start using this stuff in your practices and you'll see a stunning transformation in the way they play the game! I bet you're hungry for more details... so let's break this down a little further. Developed by Scott Phelps, who has worked on speed and conditioning improvement with numerous professional teams and athletes, including Major League Softball , NFL Football, NBA Basketball, US Olympic Programs, and collegiate sports, the Explosive Softball System is filled with the drills and instruction that can send your softball team's athleticism -- soaring off the charts. 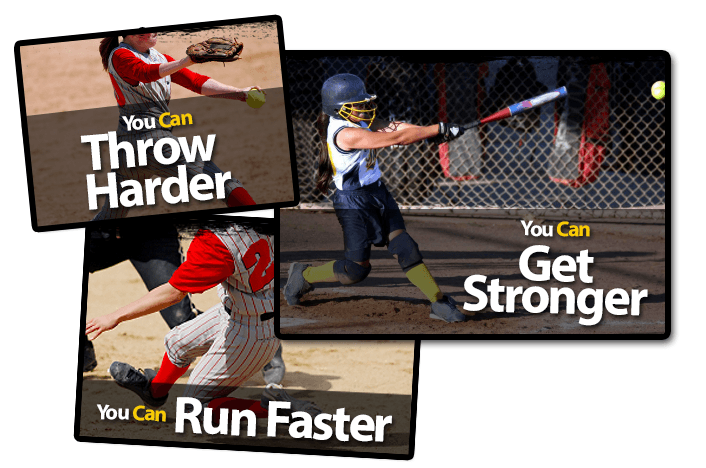 With this video training system you will discover what most softball coaches unfortunately never learn -- how to dramatically improve their players' strength, speed, quickness, agility, and power... and gain an immediate advantage on the competition! The system is broken down into four modules, each focusing on a specific area of athletic development that translates immediately into better performance on the field. How to develop the explosive hip rotation that allows hitters to load up their swing and drive the ball a country mile, even if they weigh 90 pounds soaking wet! A powerful drill to build strength and stability in players' lower bodies so that can suddenly get around the bases that much faster! The amazing drill that develops first step explosion and lateral quickness... and will have hitters exploding out of the box and fielders shutting down gaps in no time! A fun little "pickup" game that develops awesome power in the legs and will benefit players both offensively and defensively! How to loosen up the hips and develop the full body agility that all great pitchers need to maximize their velocity! A fun drill that improves players' foot speed and hip power... almost instantly! How to increase athletes multi-directional speed so that they can get to balls whether they are hit to either side of them, in front of them or behind them! How to develop the first step explosion that will transform your girls into turns them into base-stealing machines! Everybody knows "speed kills" -- discover the powerful drills that turn players into speed demons capable on defense of getting to balls no one else can and capable on offense of turning outs into singles, singles into doubles and doubles into triples! A fun ball drop drill that develops explosive quickness so fielders can start getting to even the most difficult to reach balls! How to dramatically improve quickness and reaction time so that fielders are always in great position to make plays! Send speed on the basepaths soaring with this drill that improves crossover and first step explosion so players are able to reach top speed in a hurry – this one's an absolute MUST for your "slappers"
How to develop blazing speed around the bases using simple but highly effective drills! How players can develop the explosive first step and speed they need to get out of the box and to first base faster than they ever have before! Get ready to stun your opponents with a barrage of infield singles! How to improve foot speed -- quick feet make any player a better fielder, hitter and base runner! A great drill for increasing speed and acceleration on the base paths -- do this and players will soon be taking extra bases, stealing bases and scoring a lot more runs! Take base running to the next level with drills that improve a player's balance and acceleration! A clever drill that teaches players to explode into a full sprint so that they are at top speed immediately -- this drill could send your stolen base totals soaring! How to condition muscle tissue to react explosively during games! This one drill alone will send your hitters' bat speed through the STRATOSPHERE! How to recruit more muscle involvement and teach the body to be fast out on the base paths! How to explode off the ground with power and speed -- great for fielders that have to dive to make a play or base runners looking to get to top speed fast! How to combine explosive movement with maximum muscle recruitment to develop amazing throwing velocity. Give your pitchers an extra 6-10 MPH almost immediately! The easy-to-do drill that teaches players to generate much more force, and thus go much faster, when running so that they are able to get to more balls on defense and more bases safely on offense! How to develop the core strength that allows your girls to rotate explosively through the swing, and punish the ball with devastating power! The "med ball" drill circuit that teaches the body to "load and explode" so that players are able to powerfully spring into action in an instant out on the diamond!more! Also remember, since this is a video training system, you can watch the drills over and over again to ensure you know them and perform them properly for maximum results. We'll Even Show You How To Structure The Workouts With Your Team... Including Specific Instructions On Reps And Sets! If you want to help your kids reach their TRUE potential... if you want to unleash the athletic ability hidden inside your roster right now... if you want to win more softball games this year and bring home the championship hardware in your league... then this is the training system for you! Maybe you know a bit about athletic development and want to update your techniques for the 21st century. Maybe you coach young kids, and you're looking for some new activities to inject some fun and excitement into your practices. Or maybe you're an experienced veteran in an ultra-competitive league... and you're looking for that "extra edge" that'll make your squad impossible to beat. Whatever your personal situation, the Explosive Softball System can work for you. This system is filled with high intensity video training that works. Start using this system and in no time at all, you'll be amazed at the things your players are able to do. STAYING HEALTHY, fit and injury-free for the entire season! To get the Explosive Softball System and start making these dreams come true, simply click on the Add to Cart button below. Fill out your information on our secure page, and we'll direct you into our secure members area... where you can access all the material right away. It's easy too. No "tech" experience required. If you know how to click a mouse, then you have all the skills you need. You can stream the videos over your Internet connection, watch them on your tablet or smart phone or save them to your computer to watch any time. You can even share the online clinic with the rest of your coaching staff... so everyone's on the same page and ready to rock for your very next practice! Registering for this online clinic gets you complete lifetime access to everything. There are no time limits... no hassles... and no pressure. You learn everything on your own schedule. So what does a training system like this cost? Well, private sessions with athletic trainers can typically run upwards of $120 per hour. And it would take at LEAST 4-5 hours to teach all these cutting edge techniques to your team. So if you found the right trainer - someone like Coach Phelps with elite-level experience (who had the time and was actually willing to work with you) - you could potentially learn this stuff on your own, but it would likely set you back $480 or more. Not only that... private training sessions are "one and done." 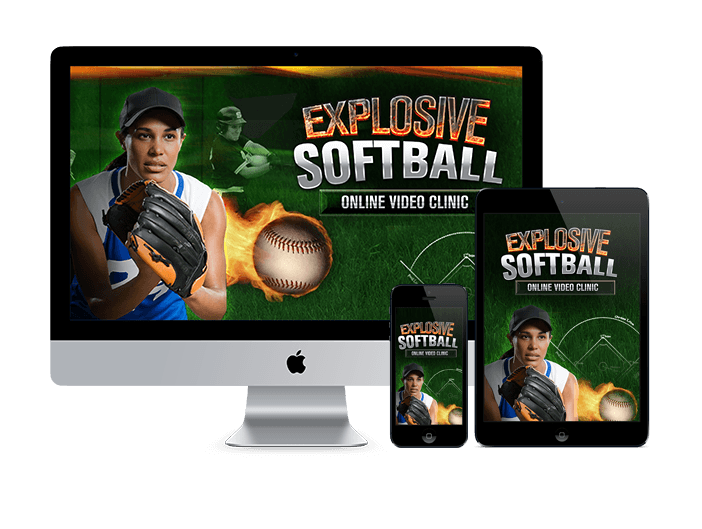 With the online videos you'll find inside the Explosive Softball System, you can return to our members area as many times as you like! I figured the four modules were worth $29.95 a piece (minimum)... so my original plan was to sell the full package at a nice discount of $97. But I want to get this into as many hands as possible, so coaches all over the world can help their kids maximize their athletic potential... win more games... and experience the joy and satisfaction of coaching a championship softball team. So, if you order right now, before this special offer ends, you can have the entire package for just $97 $29! That's a $68 savings! It's time to stop falling for the myths, and start teaching your kids the secrets to Explosive Athletic Ability! And here's where it gets REALLY good. If you're one of the first 200 coaches to order Explosive Softball this season, I'll also throw in this free bonus gift! This intensive video training will take your athletes' speed and agility to levels you never thought possible! You'll learn how to improve their running form, for a smoother, longer gait that dramatically improves their speed... how to build stabilizer muscles to prevent common knee and ankle injuries... how to install more fast-twitch muscle fibers into the upper and lower body... and a lot more! And if you don't already own an agility ladder, we'll show you how to make one in less than 2 minutes, with the help of just one common household item! With Our Unconditional 100% Money-Back Guarantee, You've Got Absolutely Nothing To Lose! We are so sure that you will love the Explosive Softball System and that it will help you improve your team's hitting, pitching, baserunning and fielding, that we are offering an unconditional 100% money-back guarantee. That's TWO FULL MONTHS to put this system to the test! Either get the drills and tips you need to help your team play better softball or get your purchase price back! Plus, when you order now you'll get instant access to all the video training materials via the Internet so you can begin training and taking advantage of all the expert tips in just a few moments! The truth is we all have the ability to become more athletic. But I can't make you do it. If you want your kids to improve physically ... if you want to help them reach their TRUE softball potential... it's up to you to take the necessary steps. Do you want to learn the secrets to explosive bat speed, and see your hitters knock it out of the park on a regular basis? Or stick with "conventional" strength exercises that are more appropriate for body builders than softball players? Do you want to discover the exact drills that help your pitchers transfer maximum power into the throwing motion, and pick up an extra 6-10 MPH on their fastball? Or watch them struggle with poor mechanics, and ruin their arms in the process? Do you want to tear up the basepaths and score more runs every single game? Or play it safe with slow, conservative softball like everyone else. If you're truly interested in building a championship squad this year (and having more fun in your coaching job), you need to click on the button below and get the Explosive Softball System today. Remember, this system reveals how to condition the core, upper body, and lower body to swing quicker, run faster, and throw harder... drill by simple drill! And right now you can get this amazing system for just $29. But you must order now. The agility ladder training bonus is only available for the first 200 coaches to order this season. After that, you may be out of luck. So don't delay -- just as in a softball game to the fastest most often go the spoils. P.S. Remember, the current low price offer is a "buy-it-now-before-it-is- too-late" offer, so don't delay. Gain the physical advantage you need to take your team's performance to the next level. Order now and get instant access to everything on your computer, tablet, or smarthphone! P.P.S. Remember, if the Explosive Softball System isn't everything you were expecting, simply notify us within 60 days and we will refund your money immediately! Click the button below to place your secure order and start your risk free trial today!